Below are just a few examples of the more than 50 races we time each year, as well as the organizations we partner with to provide world class timing & race results. We would be proud to work with your event or organization and add our ever growing list of top notch events! 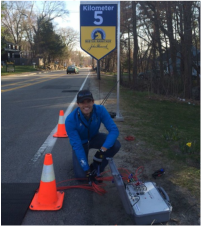 PRR Timer Zach Harsin setting up for the 5K Split at the Boston Marathon 2014.